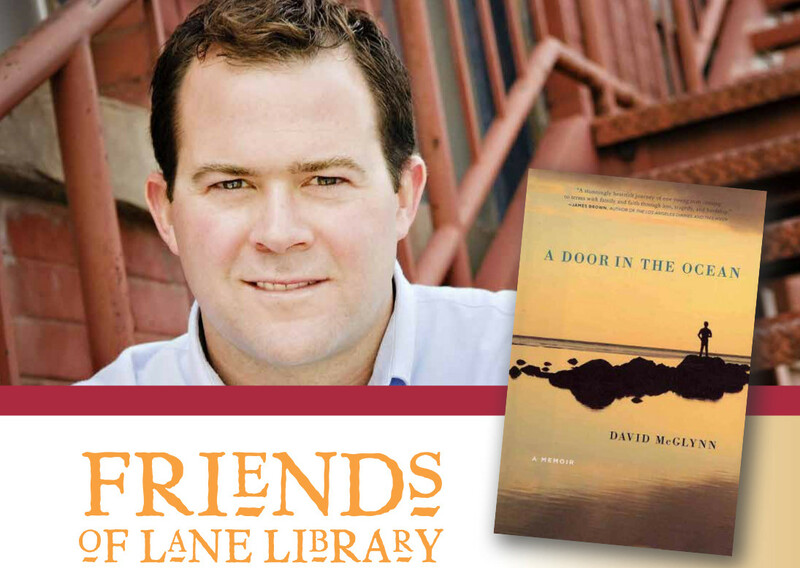 Notes from Lane Library: Guest author, book sale, it's Friends of Lane Library, 2013! Guest author, book sale, it's Friends of Lane Library, 2013! Delicious food and drinks will be served. We're very excited here around the library for our upcoming Friends of Lane Library spring festivities, which happen over the last week of the month. For those of you who don't know, the Friends of Lane Library are a wonderful group of people who want to support the mission of the library. Through their generous support, we've created the Silent Study Room, redone two conference rooms, added shelving units, purchased our first portable white board, and bought some furniture. Every year we hold a meeting to tell the Friends about what's been going on over the past year, thank them for their support, and have a guest author give a reading which is open to the whole community. We also hold our annual book sale over this time period. It begins on Tuesday the 26th and will end on Monday the 1st. McGlynn is an astute observer of relationships, and proffers insightful commentary on the power of memory to simultaneously burden and enrich the present. Beyond that, the sheer ease of his prose and the honesty of his journey are enough to keep readers moved and moving. On a warm September night in 1991, in a quiet neighborhood north of Houston, Texas, David McGlynn’s closest friend and teammate on the high school swimming team is found murdered on his living room floor. As the crime goes unsolved and his friends turn to drugs and violence, McGlynn is vulnerable, rootless, searching for answers. He is drawn into the eccentric and often radical world of evangelical Christianity—a journey that leads him to a proselytizing campus fellowship in Southern California, on a mission to Australia, and to Salt Lake City, where a second swimming–related tragedy leaves him doubting the authenticity of his beliefs. In his post–evangelical life, he finds himself exiled from his parents, plunged into financial chaos, and caught off–guard by the prospect of fatherhood. A new job offers hope for a new beginning, until the possibility of losing his newborn son forces him to confront the nature of everything he believes. The memoir’s concluding chapter, which appeared in The Best American Sports Writing 2009, celebrates the author’s love for swimming, the enduring metaphor for his faith and the setting for many of his life’s momentous occasions. Rough Water charts the violent origins of one young man’s faith and the struggle to find meaning in the midst of life’s painful uncertainties. From his website, http://david-mcglynn.com/, David has won the 2008 Utah Book Award and was a finalist for the 2009 Steven Turner Award for Best First Fiction, and was named an "Outstanding Achievement" by the Wisconsin Librarian's Association. His stories and essays have appeared in Men's Health, The Huffington Post, Best American Sports Writing, and numerous literary journals. He teaches at Lawrence University in Appleton, where he lives with his wife and sons. A lifelong swimmer, he captured a national championship in the 500-yard freestyle at the 2001 United States Masters National Championships. He now competes in open-water races, and on most mornings is the first one in the pool. Hope to see everyone here on March 27th! Check out our Facebook event page, too.